Digital watermarking of three-dimensional (3-D) meshes has numerous potential applications and has received more and more attention from both academic researchers and industrial practitioners. 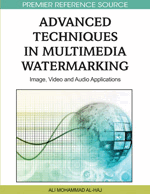 This chapter focuses on the study of blind mesh watermarking techniques, which do not need the original cover mesh for watermark extraction and thus have a much larger application range than the non-blind techniques. The authors first review the existing methods proposed so far, by classifying them into three groups: fragile schemes, high-capacity schemes and robust schemes. They then present their recent work on quantization-based blind watermarking of semi-regular meshes. Finally, some future working directions are suggested. Nowadays, 3-D models are more and more used in applications such as medical imaging, digital entertainment and computer-aided design, mainly due to the processing capability improvement of ordinary PCs and the bandwidth increase of network infrastructure. A 3-D model is often numerically represented as a mesh, which is a collection of polygonal facets targeting to constitute an appropriate piecewise linear approximation of the surface of a real 3-D object. Although there exist many other 3-D representations (e.g. implicit surface, NURBS or voxel), polygonal mesh has become the de facto standard of numerical representation of 3-D objects due to its algebraic simplicity and high usability. Unfortunately, like digital images and audio/video clips, 3-D meshes can be easily duplicated and redistributed by a pirate without any loss of quality. This illegal behavior infringes the intellectual property of mesh owners and could also do harm to the whole underlying commercial chains. Digital watermarking technique appears as an efficient solution to this emerging problem. Actually, since the seminal work of Ohbuchi, Masuda, & Aono (1997), there has been an increasing interest in mesh watermarking research (c.f. Table 1). Besides the robust watermark used for intellectual property protection, fragile and high-capacity mesh watermarks also have many potential applications such as mesh authentication and content enhancement.